The endoscopic examination and therapy of the joint and its associated surgical procedure is called arthroscopic surgery. However, this procedure involves minimal invasion. 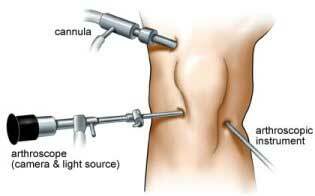 The examination is done by the use of a device called arthroscope (a fibreoptic camera). A specific fluid when passed into the joints gets illuminated on the passing light. The surgeons examine the joints in the monitor placed in the theater. This analysis helps in better understanding of the conditions of torn tissues like ligaments, cartilage etc. There are numerous advantages for this method. The main advantage is that there is no requirement for the complete opening of the joints. Arthroscopic surgery does not cause much damage to connective tissues and require much less recovery time than most of the treatments. This treatment is appropriate for sports persons as the recovery period is important for them. Torn anterior cruciate ligament reconstruction. Cutting short the worn away portions of articular cartilage. Reconstruction of a worn meniscal cartilage. Removal of unwanted loose cartilage or bone fragments. Removal of the synovial tissue that has been inflamed. Removal of Backer's cyst. These cysts are a kind of fluid filled inflammation or swelling behind the knee. Fractures or injuries of the knee bones. Local anesthesia: This is applied in order to numb the area of surgery. Spinal anesthesia: it is also known as regional anesthesia. It will be applied to the space in the spine. As a result, the patient will not be able to feel anything below the waist. General anesthesia: after applying general anesthesia, the patient will feel pain-free and also feel asleep. During this procedure surgeon first makes tiny holes in the joints. A sterile solution is poured into the joints through the holes. This solution helps to remove the unwanted materials from the joints. After the surgery, the dressing over the bandage will be covered with an ace bandage. Patients do not have to stay in the hospital after the surgery. The doctor will suggest necessary exercises for the patient. Complete recovery depends on the severity of the treated disease condition. Blood accumulation in the knee etc. If you experience any strange issues like fever chills etc, you should seek immediate care from your surgeon.